"All Day ART" & "Cannibal Flower"…. San Diego to L.A., One Day!! Let’s do this!!!! 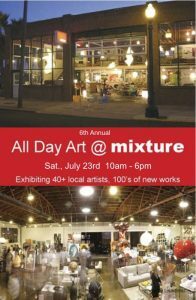 Just put the final touches on “HUMMING” and now getting ready to head on over to MIXTURE in the Little Italy area of San Diego, California for “ALL DAY ART”!!! There will be original artwork from over 40 local San Diego Artists. Live music from Todo Mundo from 2-5 pm, food, drinks, and much more!!! 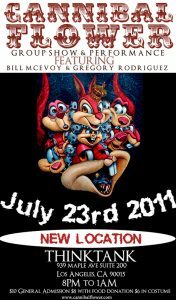 I will have 4 original paintings in the exhibit and look forward to seeing you and your friends there. I’ll be there from 10am-12pm and then on the road to L.A for the “Cannibal Flower” Exhibit tonight where “HUMMING” will be featured in the show! http://www.facebook.com/event.php?eid=138382736240559 ***Here’s a fresh shot of “HUMMING” right of the tables…. 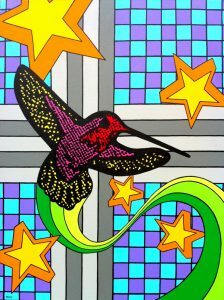 30″ x 40″ Acrylic on canvas.– Move Quick, Be precise…. FLOW! !– For pricing contact Artist.